Just wanting to make a quick introduction. As you can see from my username I am a big fan of matsumoto-san and all the downtown works. I stumbled on a few videos on youtube and searched for more on the web were I found a couple of forums who had links to subbed version and from there I was hooked. I am still a bit noobish with all the other works so appologies if I post something obvious or don't always get things right first time. 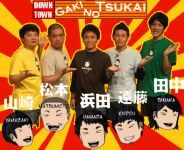 Scanning through this forum theres a lot to look at, to learn and see the other works outside of gaki no Tsukai done by the 5 main comedians. Best of luck with your studies, it's very admirable. Cool that you're interested in the comedians other work, if you have any questions I'm sure people here can help.